I had a lot of heavy cream leftover that I had bought from Costco for my Butternut Squash Soup. The smallest size they had was a half gallon and I only used one cup of it for the soup. It will be expiring soon so I had to find something to do with it. I tweeted my dilemma and someone recommended butter. Turns out it's the only ingredient you need to make butter. I had no idea it was that easy to make butter. I used the jar shaking method below. 1) Add about a cup of cream (salt can be added if you like but I made unsalted butter) to a large jar and shake it, shake it, and shake it some more. After about 10-15 mins of shaking it starts to turn into whipped cream and begin to get VERY hard to shake. You almost want to quit but don't, that means you are almost done. Just a couple more minutes of shaking and the butter will start to separate from the buttermilk making it much easier to shake. 2) Once it separates you can pour out the buttermilk and shake a bit more until no more buttermilk can be separated. 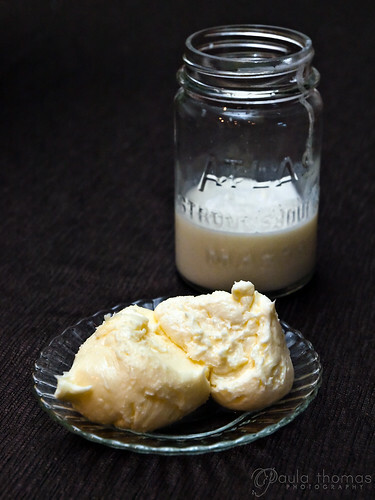 3) Rinse the jar of butter with cold water until the water runs clear to remove any excess buttermilk and you're done. You have butter! That looks like fun! I'd love to try this with my 7 yo!